So, I knew I wanted to read Knit Your Bit the moment I first heard about it. The United States had entered World War I in April 1917, and lots of men rushed to enlist, leaving their families behind. This is true for young Mikey, whose Pop is also a soldier and who has just shipped off to fight overseas in Europe. Mikey is very frustrated that he has to stay home and can't do something big and important to help the war effort, too. Nevertheless, he turns up his nose when his mother asks if he would like to learn to knit for the soldiers along with his sister. Mikey turns the offer down, because, well, boys don't knit! 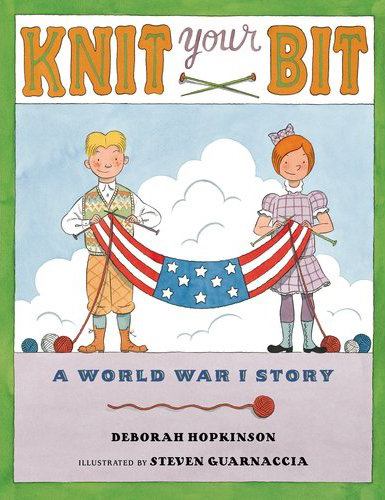 But when his teacher announces that there will be a three-day Knitting Bee in Central Park to make hats, socks and scarves for US servicemen overseas, Mikey is challenged by a girl to learn to knit and participate - boys against the girls. And so it is settled - the Boys' Knitting Brigade vs. the Purl Girls. The only problem is - knitting isn't quite as easy as the boys thought it would be. Yet, they soon master knit, and then it is on to purl. Mikey works on socks, friend Nick on a muffler and Dan works mostly on tangling and untangling his yarn. The first day of the Knitting Bee finally arrives and there are lots of people participating - men, women, girls and, yes, even other boys. And there's also lots of food, a band and before they all know it, it is time to cast on. 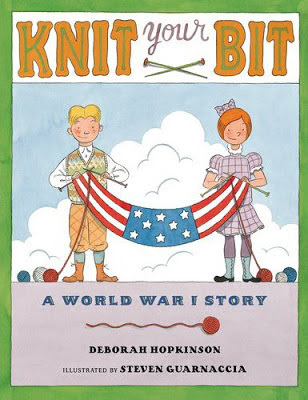 As Mikey does his best trying to knit a pair socks, he learns a mighty important lesson from a disabled soldier about what it really means to do something big and important to help the war effort and the brave soldiers overseas. But who wins the challenge? The Boys' Knitting Brigade or the Purl Girls? 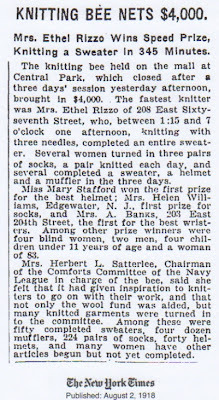 Knit Your Bit is based on a three-day knitting bee held in Central Park in August 1918 and sponsored by the Navy League Comforts Committee. It is a heartwarming story that might even bring a tear or two to your eyes. Hopkinson has seamlessly woven in Mikey's story with this event to produce a wonderful story that shows that sometimes what counts it isn't how well you do something, rather what counts is doing something out of your comfort zone, doing your best and doing it in the right spirit. Wonderfully humorous pen, ink and watercolor illustrations by Steven Guarnaccia add much to the enjoyment of Knit Your Bit. The lines are clean and simple, yet delightfully expressive, and I really liked how they reflect the clothing of the period. Hopeinson has provided lots of back matter including a Red Cross knitting poster from WWI, an Author's Note which you should be sure to read all about the real Knitting Bee and sources for more information. Though this is a story that all will enjoy, sending gifts to loved ones fighting in a war is long held tradition and for that reason, I think Mikey's story will particularly resonate for readers in today's world, especially those who have or know someone who has a relative deployed overseas. This book was sent to me by the publisher as part of a Knit Your Bit Blog Tour. For other stops on the blog tour, be sure to visit Deborah Hopkinson's blog. And guess what? You can still Knit Your Bit. All you have to do is visit The National WWII Museum to download patterns and learn how to participate. Your knitted scarves will be sent to veterans all over the country. Want to know more? HistoryLink.org has a wonderfully detailed essay on Knitting for Victory - World War I, complete with photographs, posters and even an ad. 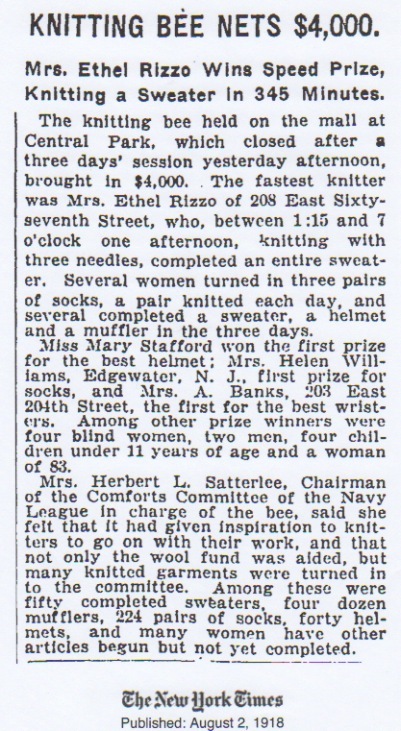 *Oh, and my dad the knitter - poor guy was in his fifties when I was born, so yes, he knitted as a young boy for WWI. Thanks for finishing your dad's story. (I did wonder.) And I love that you looked up the actual event in the newspaper. Sending a gift to war is still an honored tradition. Thanks for giving the subject room on your blog. Looks like a great read. Thanks for sharing.